It will also grind flaxseeds (linseed) if mixed with other drier seeds in a proportion no greater than 1:3 for best results. 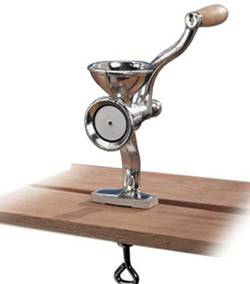 The Porkert Small Seed Grinder can also be used as a spice grinder or spice mill. We use it to grind our cinnamon. Best results obtained with seeds that have been stored in a dry place and have a low moisture content. To make butter from the flour, add a few drops of water or oil.